Are Health Centers Prepared to Increase their Capacity to Meet the Needs of a Growing Patient Base? The health center sector continues to experience impressive growth, serving almost 22 million patients in 2013, an increase of 4.6 million patients since 2008. This growth is dwarfed only by the remaining need. Today, almost 62 million people in the U.S. do not have a regular source of primary care. Health centers are striving to fill this tremendous gap, but face numerous hurdles, including gaining access to capital to expand their facilities to meet demand. Despite these challenges, health centers are also seeking ways to address the social determinants of health through creative collaborations. Capital Link’s report on the findings from our new study, Capital Plans and Needs of Health Centers: A National Perspective, sought to determine the near-term facility needs and challenges of health centers nationwide. Supported by the Health Resources and Services Administration, the assessment also gathered information on funding sources and interest in collaborative projects addressing the social determinants of health. 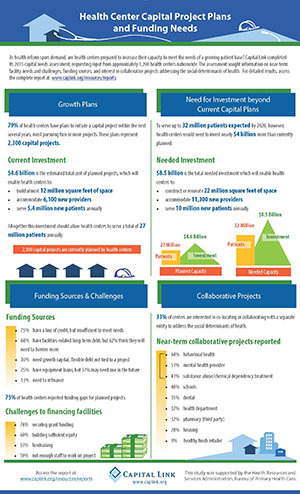 The assessment found that 79% of the responding health centers indicated that they had specific plans to initiate capital projects within the next five years, which Capital Link estimates will total approximately $4.6 billion. This investment should build almost 12 million square feet of space and accommodate an additional 5.4 million patients for a total capacity of 27 million patients and 6,100 new providers by 2020. With 32 million patients annually projected, however, total capital investment of $8.5 billion, nearly $4 billion more than anticipated, will be needed to construct or renovate a total of 22 million square feet of space and accommodate 11,300 providers. Seventy-five percent of health centers report funding gaps for planned projects, identifying securing grant funding, building sufficient equity, and fundraising as common challenges. Despite the difficulties in expanding capacity, 33% of health centers expressed interest in co-locating or collaborating with separate entities to address the social determinants of health. Near-term collaborations focus on behavioral health, mental health, substance abuse treatment, schools, and dental programs. Key findings are illustrated in our infographic. For detailed results, access the complete report online at http://www.caplink.org/resources/reports.